During the blacklist period of the late 1940s and 1950s, Hollywood shamed itself, joining a national witch-hunt designed to root out Communists from cultural institutions that presumably were being subverted. One of the people caught in this maelstrom of chest-thumping, patriotic excess was Dalton Trumbo, the Colorado-bred screenwriter who had written movies such as A Man to Remember (1938), Kitty Foyle (1940) and Thirty Seconds Over Tokyo (1944). Trumbo also wrote Johnny Got His Gun, an acclaimed 1939 antiwar novel which won a National Book Award and which shook me to the core when I read it in high school. In 1947, Trumbo was subpoenaed to testify before the House Un-American Activities Committee (HUAC). He was found in contempt of Congress for telling the Committee his political beliefs were none of its business. As a result of his defiance, Trumbo served nearly a year in prison, and was blacklisted by Hollywood studios for the next 13 years. Desperate to support his family, Trumbo — part of a group dubbed The Hollywood Ten — turned out scripts for the King Brothers, schlockmeisters who didn’t give a damn about politics. Trumbo also persuaded other writers to pose as the authors of scripts he wrote. Trumbo’s screenplay for Roman Holiday won an Academy Award. Screenwriter Ian McLellan Hunter fronted for Trumbo, and received the Oscar. It wasn’t until Spartacus (1960) that Trumbo’s name again appeared on a movie screen, thanks mostly to the courageous insistence of Kirk Douglas, the movie’s star. 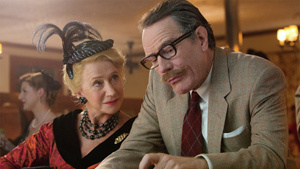 In the bio-pic Trumbo, Bryan Cranston, an actor of considerable command, plays the title role. Cranston captures the writer’s wit, commitment and contradictions. Trumbo was a leftist who liked the trappings of wealth, and made no bones about hungering for recognition. In a sometimes wooden and prosaic movie, Cranston does the kind of stand-out work that may earn him a best-actor nomination, even if — at times — it feels as if he’s doing a one-man show on Broadway. In some ways, Trumbo is a one-man show rather than a richly developed movie, but it has its merits. As the viperous Hedda Hopper, Helen Mirren gives the movie’s second best performance. Hopper was a flag-waving right winger, as well as a power hungry gossip peddler who could make or break careers and didn’t let those she wrote about forget it. Director Jay Roach faced a difficult problem in making Trumbo. He’s dealing with Hollywood personalities, some of whom are so well known they resist being played by other actors. Michael Stuhlbarg comes close to capturing Edward G. Robinson, an actor who supported those who were being demonized by HUAC, but who ultimately named names. David James Elliott has the thankless job of portraying John Wayne; he finds the intonations in Wayne’s voice, but we’ve all seen John Wayne and ... well ... you know how the rest of the quote goes. Dean O’Gorman portrays Kirk Douglas, one of the story’s heroes. Louis C.K. creates a portrait of deep-seated depression as Black Listed writer Arlen Hird, a composite character who never quite understands Trumbo’s preoccupations with success. Put another way, Trumbo wasn’t exactly a purist when it came to politics. As the crassly entrepreneurial but fiercely loyal Frank King, John Goodman steals every scene he’s in. Diane Lane plays Trumbo’s wife, Cleo. Elle Fanning has a nice scene as Niki, Trumbo’s oldest daughter, a firebrand in her own right. Roach’s previous efforts include Meet the Parents, Meet the Fockers and Austin Powers: The Spy Who Shagged Me, not exactly the best preparation for this kind of material. Trumbo doesn’t fully engage the ideological battle the Hollywood Ten fought or, perhaps, more accurately, the war that was fought against them. But even this CliffsNotes version has some emotional clout, a testament to the inherent power of the story, to Cranston’s charisma and to the fact that Trumbo’s suffering was, by any measure, entirely unnecessary.